Anyway, according to the medical encyclopedia, banana is one of the recommended diet for children recovering from gastrointestinal problems, particularly diarrhea. Basically, Banana, Rice cereal, Applesauce, Toast are called the BRAT diet that commonly recommended by physicians and nurses for binding food and make the stool harder. Besides, the high potassium in bananas is good for replacing the lost potassium in our body after vomiting or diarrhea. Thus, mummy planned to buy some flowers home while I went out for marketing this morning. As Elizabeth likes to have flowers in the house. Since she is sick, the flowers might cheer her up. In fact, flowers have healing powers. Researches show that just by looking at flowers will change our mood. We feel happier with flowers around. Thus, flowers can be a healthy gift for patients. Besides, flowers like lavender, chamomile and blue lotus even contain healing properties. Anyway, mummy was so careless. Mummy straight away drive home after marketing. I totally forgot about the flowers. Elizabeth is still sick. 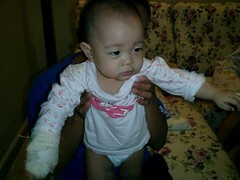 As mummy saw her condition getting serious this morning, mummy quickly call her pediatrician. Then, mummy went to the hospital to collect the Piriton from the pediatrician at about 11am. It’s always Piriton whenever she has flu. 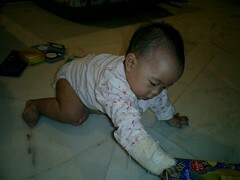 Mummy always try to let her recover on her own as it’s best to let our kids take less medicines. However, mummy just can’t see her suffer. Finally, it left mummy no choice but to go straight to the doctor. I am quite tired today. No mood to laugh either. May be it’s because of the drops from my nose. That’s irritating! What to do? Just keep rubbing my nose. Gets off you sticky thing! I keep sneezing too. That’s not fun at all! Luckily I have the new rocking chair. At least I can lay down to watch TV in this tiring day. That’s better! Thanks, dad! P/S: Sorry that the photos were so dark. As mummy forget to on flash light after turning it off to capture some food. When mummy thought it’s going to be a fine new day for Elizabeth, unfortunately she get sick. Poor girl! Mummy is still watching her. It has only the sign of flu at the moment. Nothing serious. Since medication is not advisable for light flu, I think I will just let it be first. Mummy thought Elizabeth was quite strong. When mummy or daddy were sick, she is always safe. But not this time. Kakak is the one who passed the virus to her. In short, mummy got to be always careful and watch out for those who are sick. LOL! Mummy actually keep on wrapping some hot rice in her handkerchief to left it on and lift it up from the “big bungalow” since last night. In this case, the heat from the rice actually encourages blood circulation. Thus, relief the blood clogged. And, quickly heal the bump. Weather is really hot these days. Elizabeth just can’t stand the heat. Her hair will be set on the wet look all day long if there is no air conditioning. I think it’s best to use ionizer instead of air con for our kids in this hot weather. Ionizer has health properties. It can keep the air clean and fresh. But not drying like air conditioning. It is especially helpful in reducing the harmful effects of the heat produced by the electronic appliances at home such as computers and TVs. Negetive ions from the ionizer can neutralize these postive ions. We need to keep our kids away from positive ions. As positive ions might be the cause of many sicknesses. A truck with Dodge Truck Radiator, certainly manage to keep its engine cool. On the other hand, the ionizer is used to keep our baby cool and healthy. In short, our baby need ionizer to survive healthier in this polluted world. Mummy has mentioned about Elizabeth taking Ribena pastilles a few times here. However, mummy istrying my best to avoid it actually. As mummy find Ribena pastilles is like rubber when we chew it in our mouth. Mummy is afraid that indigestible. May be mummy should check on her “Pooh Pooh” next time when she took Ribena pastilles. 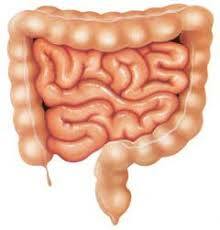 As we can clearly see anything which is indigestible appear in the baby’s “Pooh Pooh” as a whole. On the other hand, mummy really don’t like the coating of sugar on each and every piece of the Ribena pastilles. That is quite unhealthy. In fact, research in the US has shown that eating too much of candy or anything which is sweet can cause our baby to be super active. Elizabeth was sick yesterday. She caught flu. 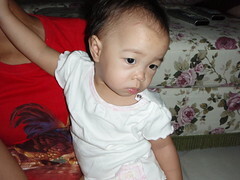 Thus, very moody and looked grumpy all the time, even when she is watching TV. Luckily there is still some medicine left in the fridge. So, mummy quickly feed her during the evening as she seems can’t stand the irritable block nose anymore. As a result, she starts running and playing happily since this morning. However, mummy was really tired because of busy taking care of her during the night. But, at least she is willing to sleep on mummy’s bed. 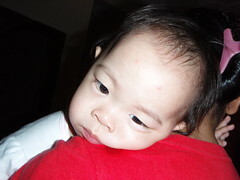 On the other hand, her “kakak” was terribly tired. Baby Elizabeth was sleeping with her granny the night before last night because mummy was sick too. 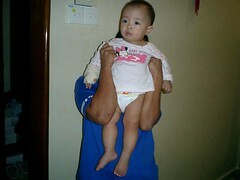 And, “kakak” was the one who carry her until the morning. Naughty Elizabeth refuse to sleep on her granny’s bed and keep crying if she was left on the bed. 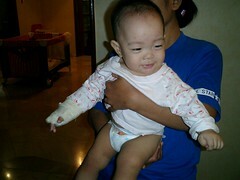 So, poor “kakak” was tortured! LOL! So, remember to spare some basic medicine especially paracetamol at home for your kids. It is just as important as the medicare insurance.